The oil stripper has a simple structure, is easy to operate and is convenient. It is easy to transport and operate. 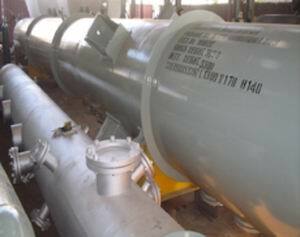 The oil stripper is one station in an solvent extraction plant. 1. Comprised of a stripper tower, mid-tower section and tower kettle made of inclined stainless steel plate. From two steamed flash of thick hair oil mixed by the first quarter of direct steam long pipe thread into stripper formed first steam for diffusion, mix the oil from top down by the butterfly plate, rotate, form relatively thin oil film, collect the mixed oil turn down after the inclined plate through stainless steel. All the oil film at the bottom and collect, in the third quarter by tower kettle for direct steam again, mix the oil was steam into the rotation, to trace the tangent of solvents and oil and separated in this part of the direct steam from the bottom on the inclined plate and the oil film, in order to prevent contact with soluble oil, set up the cone bottom bottom last stripper tube back to the collection of stripping tower, to ensure the oil pan of oil containing soluble index. Mixed steam pipe from the top to the condenser export. After stripping tower of oil from the bottom, then the oil tank, oil to reoccupy pump into the refining workshop.